Like everything else in our lives, our skin changes as we get older. Some of those changes can be painful, and some of them can just be aesthetically displeasing. This blog will talk about some common skin changes, as well as offer some basic suggestions for how to handle those changes. From laugh lines to sunspots, our skin is usually the first thing to show our age. The common visible signs of aging include rougher skin, slack skin, wrinkles, and sun spots. Dry skin and itchy skin are also common as we age. About 85% of older adults experience “winter itch” caused by temperature drops and exposure to dry indoor heat. There are also changes happening beneath our skin that affect our skin’s health. These changes include degradation in collagen and the elastic fibers that allow our skin to stretch. We also see reduction in healthy skin oils that can leave our skin feeling dry and rough. Medical skin conditions also tend to come to light during this time, such as eczema. Skin infections can also become more prevalent with conditions like diabetes. As life expectancy continues to rise, looking after our skin should become part of our healthy lifestyle to keep us looking our very best. How your skin ages depends on a variety of factors – some based on heredity and others based on lifestyle. Here are some lifestyle changes you can make to better manage your skin care. The amount of time you spend in the sun can affect your skin long term. Try to limit your time outside when the sun is the strongest, between 10 am and 4 pm. If you do have to go out in the sun, be sure to regularly apply sunscreen with an SPF of 30 or higher. Sun screen should be applied at least every two hours. Studies have shown that smoking accelerates aging by hampering the blood supply to our skin that keeps it looking healthy and young. Aside from age, smoking is the strongest predictor of facial wrinkling in men and women. Our skin is constantly being exposed to drying factors – sun, wind, water. It’s no surprise that keeping our skin hydrate by moisturizing daily (and drinking plenty of water) can help our skin maintain its supple appearance. 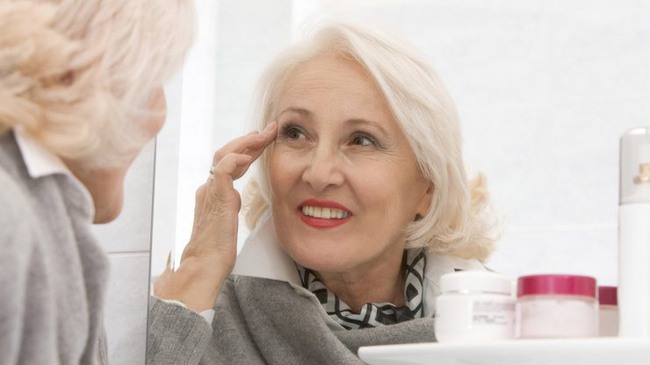 Taking care of our skin is incredibly important as we age. Perhaps the best practice for skin care is to appreciate your skin and your body for the job it does protecting you. Wrinkles and skin imperfections are an inevitable part of aging to some degree, and should be worn as a badge of honor as it shows our wisdom and hard work we’ve done to get to here. But if you need, or want, some extra help keeping your skin as healthy as possible, follow the tips above and talk to your doctor. They may be able to recommend other lifestyle and dietary changes, as well as professional skincare treatments. Do you or loved one wish to stay at home and out of a nursing home? The goal of the LIFE Program is to keep seniors living at home, while receiving the medical and supportive services they need. Senior LIFE’s services are customized to meet the specific needs of each individual and include physicians and specialists, nursing care, physical, occupational and speech therapies, personal and home care, medications, meals and nutritional counseling, eye, dental and foot care, durable medical equipment and other medically necessary services. Want to learn more, or join our mailing list? Visit our website by clicking here!